This patch adds coach cyberfaces for Steve Kerr, Luke Walton, Jeff Hornacek, Derek Fisher, Tyronn Lue, Earl Watson, and Fred Hoiberg. It can also be used with NBA Live 2005, NBA Live 06 and NBA Live 07. The faces are converted from their player faces. Credits to BAYAG and S_Brat for a couple of the faces used. Note that Luke Walton has been included as an alternative to Steve Kerr, as he is filling in as head coach of the Golden State Warriors as of the time this pack was released. 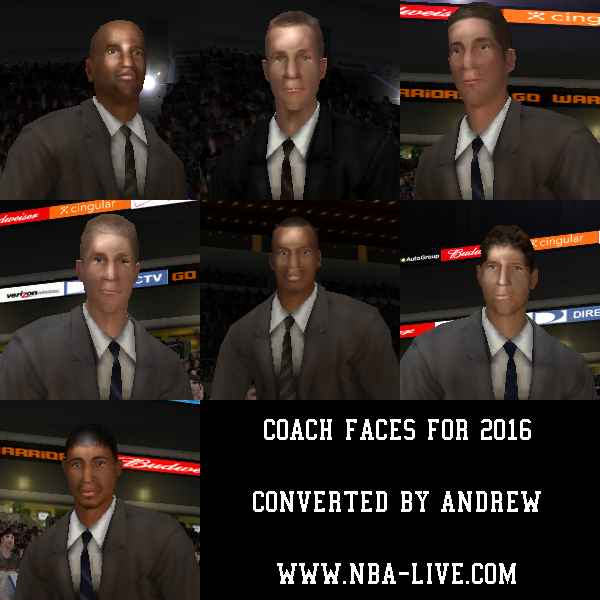 To add the coaches to a roster and assign the faces, run the included batch files. For more information, please see readme.txt. Headshapes aren't perfect, and matched as best as possible. If you'd prefer to use the default headshape (ie the one loaded when a headshape .ebo file can't be found), simply remove the appropriate .ebo file from your sgsm folder. Extract art and shape files to sgsm folder. Use batch files to update the coaches.dbf file in your roster save. For detailed instructions, please see readme.txt.